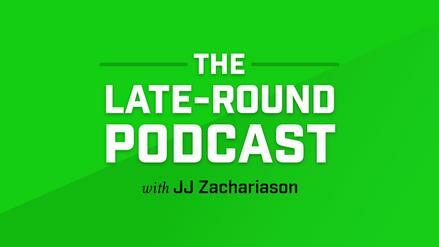 The NFL is undoubtedly a pass-first, ask-questions-later league. Will we see a record high of 4,000-yard passers in 2018? My wife is a huge fan of old things. She loves classic literature, she prefers to thrift her clothes and go antique shopping instead of buying fancy new stuff, and she even likes hanging out with people whose average age is well beyond AARP eligibility. Still, even my old-souled wife appreciates the new, modern era of the NFL, where passing far outstrips the running game (and donâ€™t get her started on how much she loves one quarterback in particular). Studies have shown time and again that the high-flying passing attacks of the NFL are not only popular, they are more efficient and valuable to NFL teams than the run game. Still, there has to be some sort of diminishing returns here, right? How many big-time passing producers will our modern environment yield in 2018? This question came up thanks to Sports Betting Dimeâ€™s posted over/under odds on 4,000-yard passers this season. The threshold was 11.5 players. Is there betting value here? If I were to ask you which time period had more 4,000-yard passers â€“ the 1970 AFL-NFL merger until 1999, or the last three NFL seasons (2015 to 2017) â€“ what would you guess? If youâ€™ve been paying attention this far, youâ€™ll likely suspect that the 2015 to 2017 period wins that contest, a huge testament to how prolific passing offense has become. But comparing the earliest era of the unified NFL is like comparing apple carts to rocket ships; in order to truly see what trends are occurring in football that we might be able to get out ahead of, we need to dig deep into the passing marks of recent years. 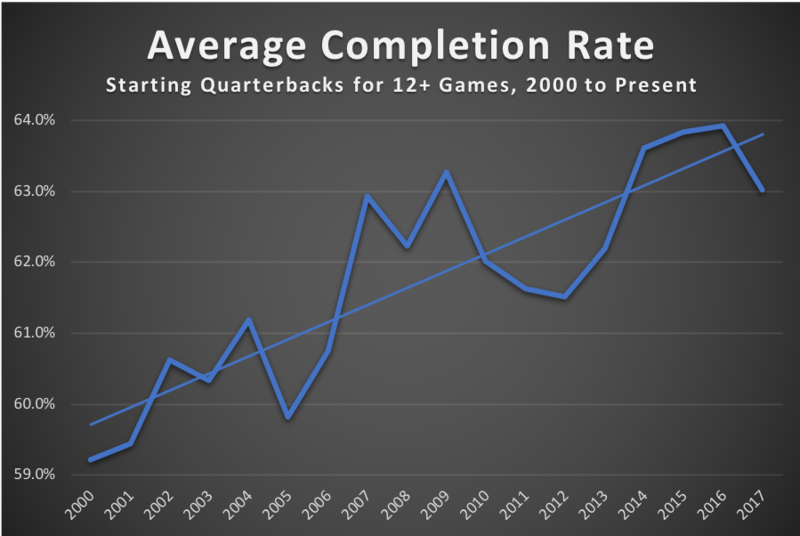 The chart below shows the number of quarterbacks to throw for more than 4,000 yards in each season, from 2000 to the present day. There is a very clear trend to these seasonal outcomes. 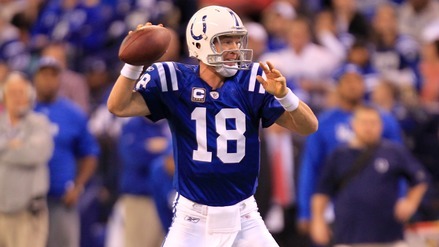 Itâ€™s obvious that as the years have gone by, the number of â€œpremierâ€ quarterbacks also increased. 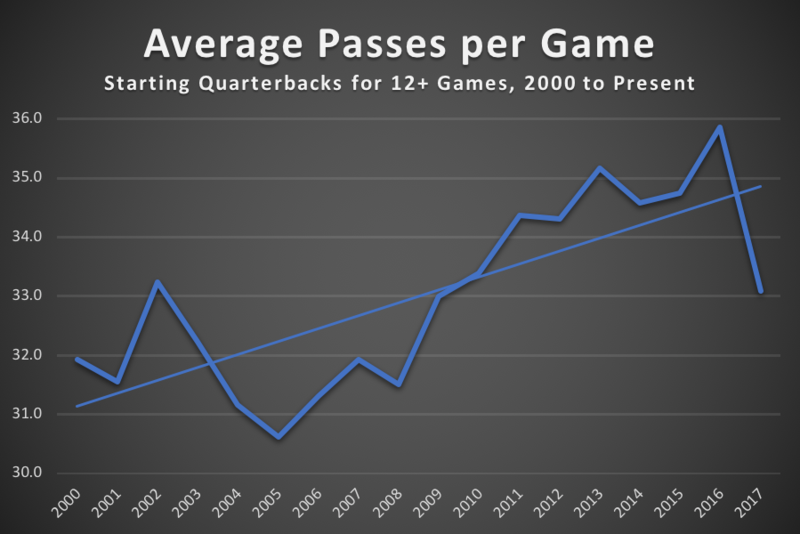 Aside from the random year-to-year fluctuation, the number of 4,000-yard passers has swelled over the last decade-and-a-half -- in fact, quadrupling from 2000 to 2016. A major outlier to this trend shows up, however: the 2017 season, when the number dropped from an all-time high of 13 in 2016 to just 8 last year -- a total more in line with a decade ago. Last season was clearly an outlier year. 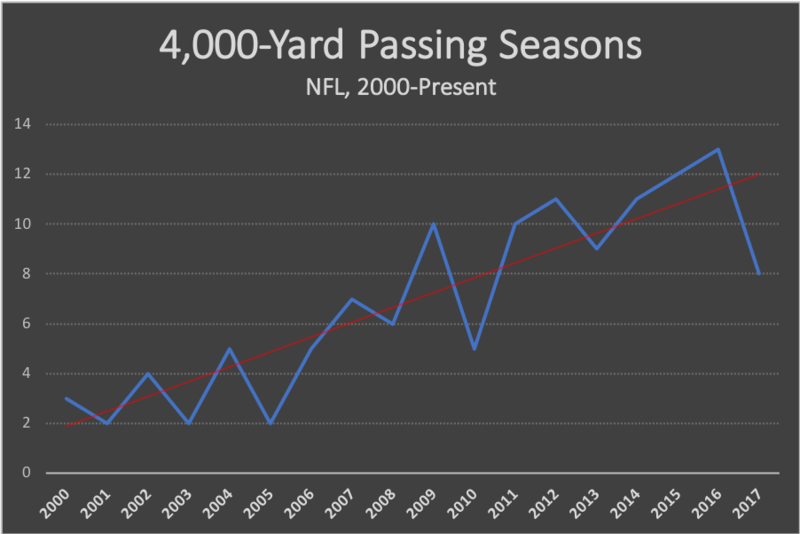 With the trends of passing volume going steadily upward for the better part of four decades, such a severe drop in 4,000-yard passers is a shock. Only one year saw a similar plunge, and that was between 2009 (10) and 2010 (5). What was the cause of last year's dip? The first thing is that a significant number of quarterback situations became unsettled last season. Players like Aaron Rodgers had season-ending injuries, Tyrod Taylor was benched for a stretch of time, Mitchell Trubisky was forced to wait behind Mike Glennon to start the year, and the Denver Broncos never decided on one passer for any length of time. In all, 10 teams had multiple quarterbacks with at least 100 drop backs -- and that doesnâ€™t count late-season injuries or benchings that rattled others. For this reason, the average season count of pass attempts for quarterbacks who started at least 12 games plummeted last year. The chart below shows this for seasons since 2000. That raw number is easily accounted for, however, by the average quarterback sharing a role last season much more than in recent memory. 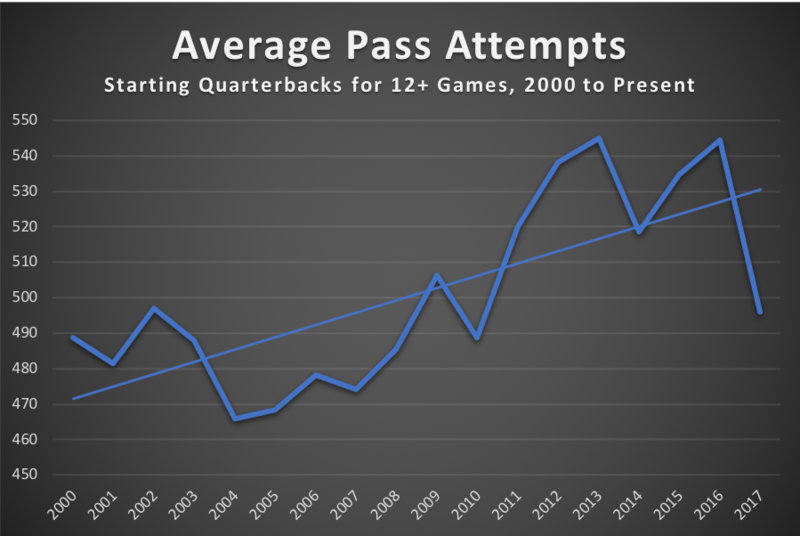 What isnâ€™t fully accounted for is the fact that the average pass attempts per game also fell significantly last year, to its lowest point since 2009. After the league as a whole called the highest percentage of passing plays versus the run in history in 2016 (1.46 pass-to-run ratio; nearly three passes to every two runs), 2017 saw the NFL as a whole drop to a 1.36 pass-to-run ratio for play-calling. With so many star quarterbacks injured and quarterback rooms unsettled, teams seemed to turn to the ground game to anchor their offenses last year. Young quarterbacks like Jared Goff still had Todd Gurley to rely on, and backups like Jacoby Brissett got Frank Gore to pound the rock 250-plus times. Offensive coordinators werenâ€™t willing to let passers (literally) throw games away under center, so they instead trusted that backs would get the job done -- rightly or wrongly. But is this simply a one-year fluke, or is it a regression to the mean for a league thatâ€™s continued to push an unsustainably high amount of passing offense? With the offseason in full swing and teams figuring out their intended identities for next year, it seems like a good time to explore the landscape of NFL offenses and see where we are headed come this fall. While last year would seem to indicate a return to a more ground-oriented game for pro football, in reality it was more likely just a slump in offensive effectiveness. 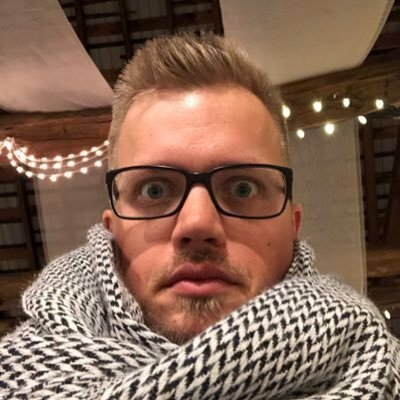 For the first time since 2013, the average offensive play dropped to just 0.03 schedule-adjusted Net Expected Points (NEP), and teams ran an average of just 68.0 offensive plays per game (least since 2010). 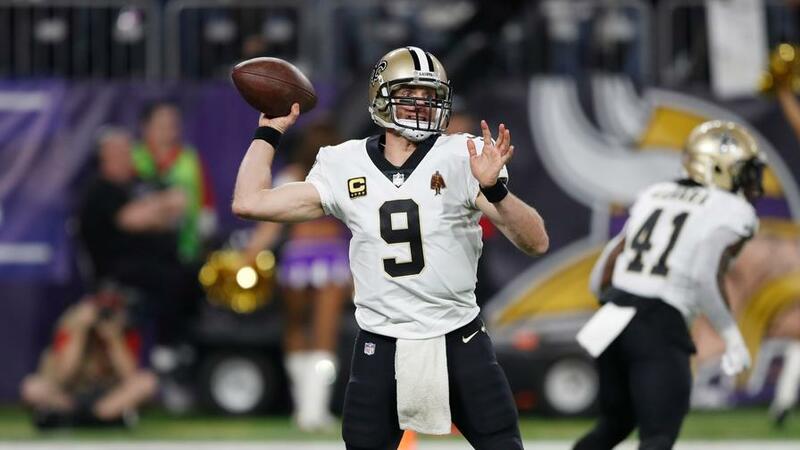 With that in mind and most of the uncertain quarterback situations from last year re-settled, we should see a return to the norm in 2018 for the NFLâ€™s passing games. If teams simply return to their five-year averages in terms of pass attempts per season and yards per attempt (per Pro Football Reference), we should see at least nine 4,000-yard passers in 2018. However, our preseason projections are even stronger in their belief in an aerial assault bounce-back across the league. The table below shows the 11 passers we forecast to eclipse the 4,000-yard mark this season, with their projected attempts and yardage rounded to the nearest whole number. Getting back to Sports Betting Dime's line, 11.5 is a very close over/under, but our models also have an additional three quarterbacks we believe will come within 100 yards of our threshold. For you betting minds, putting a few gummy bears on the over of 11.5 4,000-yard quarterbacks isnâ€™t a bad idea, considering our projected floor for prolific passers is dead-on with the line and the possibility that one of these three quarterbacks in the table above could also push for 4,000 is pretty good. For fantasy football, as well, last yearâ€™s offensive ineptitude shouldnâ€™t rear its ugly head again (knock on wood). 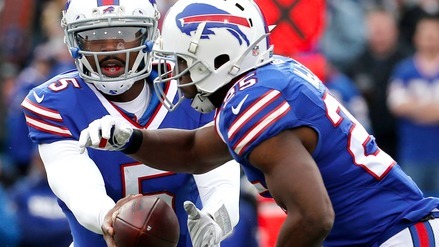 The drumbeat of passing progress for NFL offenses will likely resume without a hitch in 2018.